St. Isidore School's first graders jump into action to raise money for the American Heart Association. Posing for the presentation of the $5,090 check for their fundraiser are, from left, St. Isidore fifth grader Dylan Aponte, Margaret DeGennaro representing the American Heart Association, event organizer and St. Isidore teacher Sean Harrigan and student Katie Offner. 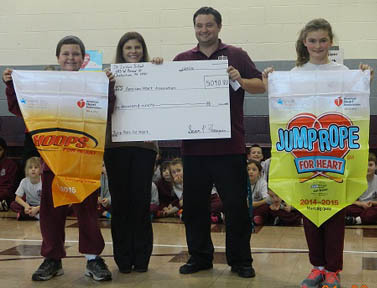 When St. Isidore School in Quakertown was looking for a good Catholic Schools Week project, they decided on a jumping rope program, and maybe at the same time raise a thousand dollars or so for the American Heart Association. Now what does jumping rope have to do with the heart? A lot, if you ask the experts, because it is a great cardiovascular exercise that really builds up endurance and is highly recommended, at least if you don’t have joint problems. If you think jumping rope is just for girls, think professional boxers: how do you think they develop the endurance to dance around the ring for 15 rounds or so, provided they are also good at ducking punches? “I love jumping rope,” said Will Robinson, in fifth grade. More than 200 kids got involved in all kinds of rope jumping, including double-dutch and just free style and the trick was getting in sync with the pattern, he explained. As for that goal of raising $1,000, the school actually raised $5,090 and through his family and friends Robinson raised $145. As for St. Isidore, which has about 250 students, “I like the teachers and the learning because we are not a big school we get to know everybody,” Rindgen said. 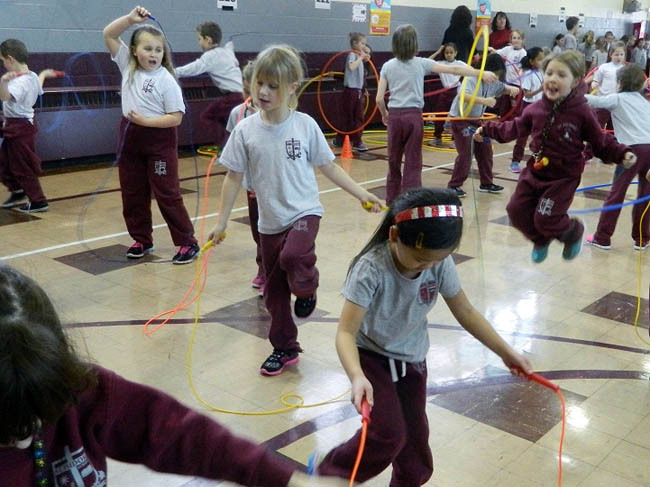 The fact that the jumping rope program was both a fun activity and a fund-raising activity is typical of the school, according to Robin Conboy, St. Isidore’s principal. “We don’t just work in our own community, we encourage kids to learn to help others,” she said. As an example, Friday, Jan. 30 “will be ‘souper’ bowl day,” she said. Everyone who brings in a can of food can wear their favorite team’s shirt, and the food will be donated to a local charity. Another event coming up in February will be a blood drive, and the class that brings in the most donors will have a free dress-down day, the principal added.